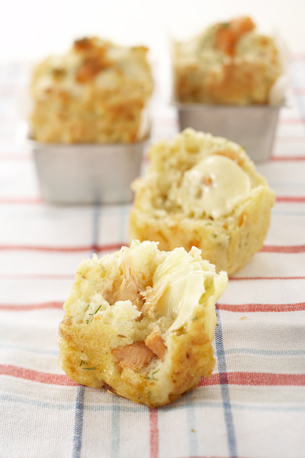 Make these in a mini muffin size pan and serve with NUTTELEX as an appetiser. You can also make them larger and serve draped with smoked trout and a dollop of Greek yoghurt or sour cream as a delicious first course. Makes approx. 12 mini breads. 1Sift flour and baking powder together in a bowl. Add cheese, dill and pepper. 2Beat egg lightly, add milk and melted NUTTELEX. 3Add liquid ingredients together with trout to dry ingredients. 4Mix together with wooden spoon until combined but don’t overmix as mixture will toughen. 5Spoon into greased muffin pans. 6Cook at 210°C for 10–15 minutes or until quick breads are well risen and golden brown.